In the spring of 1976, George Andrews of Pennsylvania State University visited the library at Trinity College, Cambridge, to examine the papers of the late G.N. Watson. Among these papers, Andrews discovered a sheaf of 138 pages in the handwriting of Srinivasa Ramanujan. 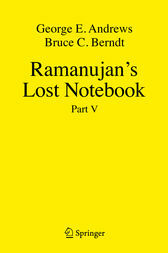 This manuscript was soon designated, "Ramanujan's lost notebook." Its discovery has frequently been deemed the mathematical equivalent of finding Beethoven's tenth symphony. This fifth and final installment of the authors’ examination of Ramanujan’s lost notebook focuses on the mock theta functions first introduced in Ramanujan’s famous Last Letter. This volume proves all of the assertions about mock theta functions in the lost notebook and in the Last Letter, particularly the celebrated mock theta conjectures. Other topics feature Ramanujan’s many elegant Euler products and the remaining entries on continued fractions not discussed in the preceding volumes. "Fans of Ramanujan's mathematics are sure to be delighted by this book. While some of the content is taken directly from published papers, most chapters contain new material and some previously published proofs have been improved. Many entries are just begging for further study and will undoubtedly be inspiring research for decades to come. The next installment in this series is eagerly awaited." "Andrews and Berndt are to be congratulated on the job they are doing. This is the first step...on the way to an understanding of the work of the genius Ramanujan. It should act as an inspiration to future generations of mathematicians to tackle a job that will never be complete." George E. Andrews is currently a professor of mathematics at Pennsylvania State University. Bruce C. Berndt is currently a professor of mathematics at the University of Illinois.